Two diamonds that initially look alike may, in fact, be very different and the value of two diamonds of equal size can vary greatly. To understand these subtle differences is to understand the Four C’s: Cut, Colour, Clarity and Carat-weight. It is these characteristics that determine the value of a diamond. Of all the 4C’s, cut is the one most directly influenced by man. The other three are dictated by nature. The cut or make of a diamond will dramatically influence its fire and sparkle, for it is the polisher’s skill that releases its beauty. 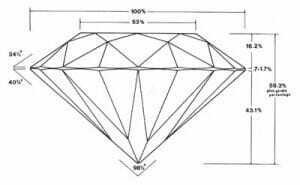 You therefore need to ensure that your diamond has good proportions. ¹ When a diamond is cut to good proportions, light is reflected internally from one facet to another and then reflected through the top of the stone giving it maximum sparkle or brilliance. ² If the cut of the diamond is too deep, some light escapes through the opposite side of the pavilion. ³ If the cut is too shallow, light escapes through the pavilion before it can be reflected. The colour grading scale ranges from totally colourless to yellow. The differences between one grade and another are very subtle, as can be seen by the number of grades within any one category. Subtle colour differences allow gem quality diamonds to be graded from the prized, totally colourless stones, to the highly prized rare stones with strong colour – Fancy yellow being the most popular. Almost all diamonds contain minute mineral traces called inclusions. Most are not visible to the naked eye and require magnification to become apparent. The fewer the number of inclusions or imperfections, the more rare and hence valuable the stone will be. Clarity is the term used to indicate the extent to which the diamond you purchase is free of these inclusions. As with all gemstones, the weight of a diamond is expressed in carats. The word carat originated from a natural unit of weight: the seeds of the carob tree. Diamonds were traditionally weighed against these seeds until the system was standardised and one carat was fixed at 0.2 grams. One carat is divided into 100 “points”, so that a diamond of 25 points is described as a quarter of a carat or 0.25 carats. A trade term for an intensely coloured yellow diamond. The yellow may be very slightly greenish or slightly orange, but the colour must be deep enough to become an asset. Such a diamond is called a fancy. A stone with colour greater than Z on the GIA colour scale. A broad range of diamond colour grades that show a distinct yellow tint face up (except for small stones in the top part of the range). The best grade in the cape group is variously called top silver cape, top cape, light cape, fine cape or silver cape, depending on the grading system employed by the grader. In a three grade cape range, top silver cape, silver cape and cape are commonly used; top (or silver) cape, cape, and dark (or low) cape comprise another three-grade system. Any number of other combinations of terms are, or have been, used to cover the cape range in from two to five or more grades. Perhaps most commonly, cape series is used as the colour grade below top cape in the river-to-yellow system. For an approximate comparison of this grade to the GIA grading system and other not so common grading systems, please see the table at the end of this page. A term that is used in the diamond trade to refer to any black-appearing inclusion or imperfection in a diamond. Black inclusions may occasionally be graphite or small particles of another black mineral. Although many diamonds contain inclusions that appear black under ordinary lighting; dark-field illumination and magnification shows most to be caused by reflections from cleavages or included transparent crystals. A trade term for a greenish-yellow or yellowish-green to brownish-yellow diamond that is not of sufficient depth of colour to be considered a fancy. Gem diamond is about 99.95% to 99.98% pure carbon. Common impurities, some of which may contribute to colour, include iron, silicon, calcium, magnesium, nitrogen, aluminium and boron. In the trade, the term is used collectively to describe smaller brilliant cut diamonds, whether full cut or not. Usually, all small gemstones used in embellishing mountings, settings, or larger gems are called mêllée. A diamond that has a milky or hazy appearance. This condition is usually caused by clouds of exceedingly minute inclusions. Excessively fluorescent diamonds sometimes have a milky appearance in daylight. A term that meant originally the distribution of the mass of a fashioned diamond above and below the girdle. Use by diamond men has broadened its meaning to include the major facets that determine cutting quality; i.e. total depth as a percentage of the girdle diameter, table diameter, girdle thickness, facet angles, symmetry and even details of finish. A diamond in its natural state. An uncut or unpolished diamond. A simple form of cutting that has a circular girdle, a table, eight bezel facets, eight pavilion facets, and rarely, if ever, a culet. It is used mainly for small mêllée. A term used to refer to a ring containing a single diamond or other gem. A man-made stone that has approximately the same chemical, physical and structural properties as its natural counterpart. Many synthetic gem materials have been manufactured, but only a few are made commercially and cut as gemstones for the jewellery trade. An early trade term still used by some dealers to designate the diamond colour grade between crystal and cape in the river-to-light-yellow system. Diamonds in this classification have a yellowish cast that is visible to the unaided eye. For an approximate comparison of this grade to the GIA grading system and other not so common grading systems, please see the table at the end of this page. An early trade name still used by some dealers to designate the diamond colour grade between Wesselton and crystal in the river-to-light-yellow system. Diamonds in this classification show a very slight tinge of yellow. For an approximate comparison of this grade to the GIA grading system and other not so common grading systems, please see the table at the end of this page. A diamond that has been coated, fracture filled, laser drilled, or otherwise treated to improve or change its colour or appearance. An early trade term still used by some dealers to designate the diamond colour grade between top Wesselton and top crystal in the river-to-light-yellow system. Only the faintest tint of colour is visible under ideal grading conditions. Embedded in Jewellery and Gemstones are centuries of different beliefs and associations. A round Brilliant cut diamond is considered as a classic and traditional choice. For some the circle shape parallels the symbolic association with wedding rings. A ring or round shape is representational of the idea of no beginning and no end and consequently eternity. The round brilliant cut diamond is the muse for the signature Mark Solomon four claw “floating” Solitaire ring. A ring designed to make a diamond come to life and intrigue those who behold it’s beauty! Mark Solomon Jewellers offer the largest selection of conflict-free diamonds under one roof in South Africa. The development of the round brilliant cut diamond has taken a many years to evolve in the perfect proportion for optimal light and brilliance. In 1650 C Mazarin designed the cross-cut diamond; this is where the whole legacy of the round brilliant cut diamonds really began. During the 1700s a diamond cutter, Peruzzi refined the first fifty eight facets. The brilliant cut progressed through the 1800s. During this time titles like “old mine cut” and “old European cut” were often used. Today we are privileged to have what we call the “Round Brilliant cut” with optimal reflection and brilliance that firmly holds a preferred position amongst many followers. A fully made emerald cut with larger corners. Please see our special feature on Trendy Cuts including the Asscher Cut. A mixed cut comprised of 62 facets designed and developed by Jooste’s Diamond Cutting Works (Pty) Ltd., Johannesburg, South Africa. It is a combination of two cuts, the crown being a full emerald cut and the pavilion a modified brilliant cut. A pear or drop shaped stone with a circular cross section, entirely covered with triangular facets. This form of cutting is very rarely encountered. Stones with a rectangular or squarish outline and rounded corners with facets that are usually similar to the facet arrangement of the brilliant cut. Please see our special feature on Trendy Cuts including the Cushion Cut. A style of brilliant cutting that produces a stone shaped like a half circle. A heart shaped variation of the brilliant cut that is related to the pear shape. The round end is flattened and indented and the girdle diameter across the shoulders is widened until the diameter is approximately equal to the length. 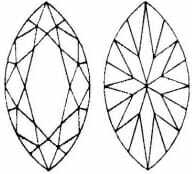 A style of diamond cutting in which the girdle outline is boat shaped. The shape and placement of the facets is of the brilliant type. See picture of a marquise cut diamond with an authentic EGL certificate. ¹ A trade term that is applied properly to an early form of brilliant cut with a nearly square or cushion-shaped girdle outline. ² A term applied occasionally and incorrectly to a somewhat more modern style of brilliant cut that also has a much higher crown and smaller table than the modern brilliant cut, but whose girdle outline is circular or approximately circular – a style of cutting that is more properly called a lumpy stone or an Old-European cut. A variation of the brilliant cut, usually with 58 facets, having a pear-shaped girdle outline often with only 56 facets when the pavilion facets at the head and tail are eliminated. A many sided form of cutting, usually step cut, the length and angles of the sides of which may vary. Resembles a shield in outline. An equal-sided, sharp-cornered form of step cutting. A modern shaped variation of the brilliant cut consisting of 44 facets; 25 facets on the crown and 19 facets on the pavilion. The girdle outline is triangular shaped, or a rounded triangular shape. A French word meaning rod. A style of step cutting for small, rectangularly-shaped gemstones. A modification of the pentagon cut, the shape of which is produced by varying the length and angles of the sides. Resembles a bullet in outline. A form of step cutting. It usually is rectangular but sometimes is square, in which case it is known as a square emerald cut. It has rows (steps) of elongated facets on the crown and pavilion, parallel to the girdle, and with corner facets. The number of rows, or steps, may vary, although the usual number is three on the pavilion. The emerald cut is excellent for colourless stones and when it is desirable to emphasize the colour of fancy diamonds. A four-sided form of cutting, usually step cut, that resembles a child’s kite outline. A term applied to the earliest form of a circular-girdled full brilliant. 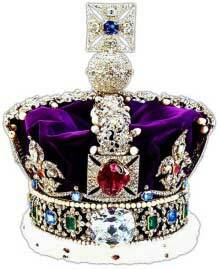 It is characterised by a very small table, a heavy crown, and great overall depth. Improperly referred to as old-mine cut. ¹ A brilliant style of cutting in which the girdle outline is elliptical; i.e. a rounded oblong. Also called the oval brilliant cut. ² Also an obsolete barrel-shaped style of cutting with a circular cross section and covered with triangular facets. A five-sided form of cutting usually step cut, with the sides of equal length. An earlier name for the profile cut invented by Arpad Nagy in 1961. It has right-angle corners and is traditionally cut to a square outline but can be cut to a rectangular outline. The cut combines the triangular facets of the brilliant cut with the step cutting of the emerald cut. A three-sided form of cutting usually step cut. A four-sided form of cutting, usually step cut, with two longer, parallel sides of unequal length and two inclined sides of equal length. One of the two basic classifications of cutting styles namely step cut and brilliant cut. 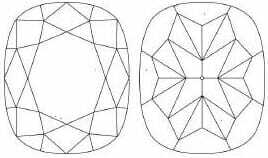 In step cut stones, all facets are four-sided and in steps, or rows, both above and below the girdle. All facets are parallel to the girdle and therefore, except those on the corners, long and usually narrow. The number of rows, or steps, may vary, although the usual number is three on the crown and three on the pavilion. Different shapes of step cuts are usually described by their outlines; for example, rectangular step cut, square step cut, octagon step cut. A rectangular step cut with cut corners is called a cushion cut, or, more popularly, an emerald cut. he most common style of cutting for both diamonds and coloured stones. 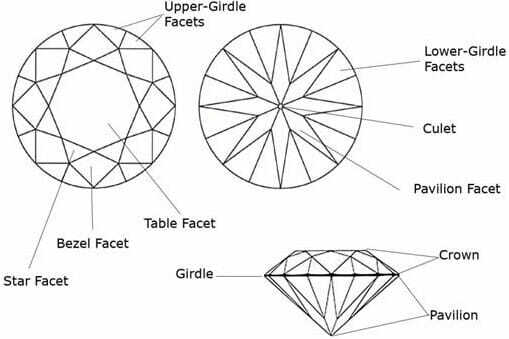 The standard round brilliant consists of a total of 58 facets: 1 table, 8 bezel facets, 8 star facets and 16 lower-girdle facets, and usually a culet on the pavilion or base. Although the Tolkowsky round brilliant ideal cut was devised to give maximum brilliancy and fire, many stones cut in this fashion do not have the Tolkowsky proportions. Modifications of the round brilliant include such fancy shapes as the marquise, oval, pear shape and many others. A diamond still remains the favoured stone of choice for engagement rings, but many women today are leaning towards yellow when it comes to choosing something unique that will make their engagement ring stand out. One of the reasons that so many women are choosing to have their engagement rings set with yellow diamonds is not just because of their unique beauty, but also because of their rarity as well. It might seem as though yellow diamonds are everywhere today, but they are still actually quite rare. Driving the trend of yellow engagement rings are celebrities. Over the last few years there have been numerous celebrities who have helped to further the trend by choosing coloured diamonds over the classic clear or white diamond. Kimberly Buffington, who is married to Dennis Quaid, is just one such bride who chose something unique and different. Heidi Klum also accepted a coloured diamond engagement ring. Both stars sport canary yellow diamond engagement rings. While no one is precisely sure whether it is an engagement ring or just a fashion ring, Janet Jackson has also been seen wearing a massive 20 carat yellow diamond ring as well. Elizabeth Taylor’s fourth husband, Eddie Fisher (May 1959) once said that “a $50,000 diamond could keep Taylor happy for approximately four days”. Nevertheless, he presented her with a bracelet of 50 diamonds as an engagement present. (In fact, when Taylor overdosed, he gave her a 10 carat yellow diamond ring for her 30th birthday and a mirror set with emeralds). Nitrogen causes yellow colour in diamonds. Boron causes blue colour in diamonds. Black diamonds are not truly black but rather contain numerous dark inclusions that give the gems that dark appearance. Nitrogen causes a slight to vivid yellow colouration depending on the type and concentration of nitrogen present. Natural yellow diamonds have been prized by collectors for many centuries. Some of the most famous diamonds are of natural yellow colour and some dating back to the 1600’s. Fancy yellow diamonds on the GIA grading system means that it is darker than a colour Z, with D being the whitest. Most natural yellow and coloured diamonds are polished in square, cushion or oval cuts and not in the typical round brilliant cut diamond. The brilliant cut reflects most of the light out of the stone, and therefore not visually suitable for a round stone. 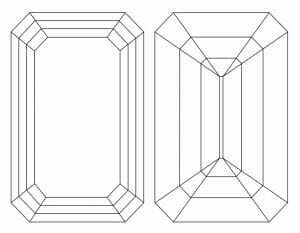 The asscher/square emerald cut is rarely found. For those unfamiliar with Asscher cut diamonds, their unique shape and cut make them stand out as something truly special. The shape is similar to that of a square emerald cut with deeper cut corners. It has been often described as being almost Octagonal in shape. Although the popularity has grown in the last few years this cut has been around since 1902 when it was first conceived by the Asscher brothers of Amsterdam, Holland. The cut of an Asscher stone takes great expertise and precision due to the numerous parallel steps cut in order to create the memorizing radiance that they are known for. Occasionally one sees this cut with fancy coloured diamonds as it enhances the natural colour of the stone. Like the Asscher cut, celebrities and jewellery enthusiasts have also fallen in love with brilliant cushion cuts. Modern cushion cuts are based on the antique cushion cuts, which are a combination of a round and square outline with a softened square or “pillow” shape. One of the most famous cushion cut diamonds was found in South Africa at one of the Kimberley Mines in 1901, The Red Cross Diamond. This 205.07 carat canary yellow diamond was reported to be 375 carats in the rough. After the Cullinan, the second largest of the world’s roughs was the 995 carat Excelsior, found at the Jagersfontein mine in the Orange Free State in 1893. The giant Excelsior was a lovely blue-white, though it had internal black spots. It was- – some say needlessy – cut into 21 gems, of which the largest weighed a modest 69 carats. Wastage in the cutting process (primarily due to the black spots) was a staggering 63 percent. It was delivered to London just before the second great Jagersfontein discovery; the 634 carat Reitz, named after the Orange Free State President, F.W. Reitz. The Reitz was later renamed the Jubilee in honour of Queen Victoria’s 60th year on the throne, and yielded one large and exceptional cut gem. The largest rough diamond ever found was the Cullinan, a massive 3106 carat rough stone, spotted in 1905 by a mine labourer at the edge of the Premier mine workings. The Cullinan, named after Sir Thomas Cullinan (who was visiting that very day), founder and chairman of Premier, measured 11cm by 6cm, and was bought by the Transvaal government for a modest $1 million to be presented to King Edward VII on his birthday in November 1907. It was cut into 96 small brilliants, nine polished fragments and nine major cut stones, two of which became famed components of the British Royal regalia. These are the 530 carat ‘Star of Africa’ (or ‘Great Star of Africa’) a drop (or pear) brilliant set in the Imperial Sceptre, and the 317 carat cushion cut brilliant ‘Lesser Star of Africa’. These are the 2nd and 3rd largest cut diamonds in the world after the Golden Jubilee, a yellow stone unveiled in 1995 which is a massive 545.67 carats and is recognised as the world’s largest polished diamond. A group of businessmen have offered the Golden Jubilee to the King of Thailand to celebrate the King’s 50 years as monarch. The Premier mine has proved a veritable treasure house of superb stones. From it came three other famed diamonds: – The Premier Rose, a 353.9 carat rough triangular shaped cleavage of exquisite colour, found in 1978. It was purchased by the Johannesburg firm, Mouw Diamond Cutting works, for around £2,5 million and named after Mrs Rose Mouw. It produced three gems, the largest a pear-shape weighing 137 carats, thet took 385 hours of cutting. The Premier mine has proved a veritable treasure house of superb stones. From it came three other famed diamonds: – The Premier Rose, a 353.9 carat rough triangular shaped cleavage of exquisite colour, found in 1978. It was purchased by the Johannesburg firm, Mouw Diamond Cutting works, for around £2,5 million and named after Mrs Rose Mouw. It produced three gems, the largest a pear-shape weighing 137 carats, thet took 385 hours of cutting. The even larger Centenary came to light in 1988. Weighing 599 carats rough and estimated at the time to be worth R60 million, it had in fact been discovered two years before the announcement. The Centenary, named to commemorate De Beers’ one hundredth birthday, is the largest of the world’s finds since the 726 carat Jonker (see below) was found in 1934. The Centenary ended up as a 273.85 carat polished gem. After the Cullinan, the second largest of the world’s roughs was the 995 carat Excelsior, found at the Jagersfontein mine in the Orange Free State in 1893. The giant Excelsior was a lovely blue-white, though it had internal black spots. It was – some say needlessy – cut into 21 gems, of which the largest weighed a modest 69 carats. Wastage in the cutting process (primarily due to the black spots) was a staggering 63 percent. It was delivered to London just before the second great Jagersfontein discovery; the 634 carat Reitz, named after the Orange Free State President, F.W. Reitz. The Reitz was later renamed the Jubilee in honour of Queen Victoria’s 60th year on the throne, and yielded one large and exceptional cut gem. The third largest of South Africa’s roughs was the Jonker, found at Elandsfontein near the Premier mine in 1934. 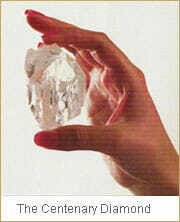 The 726 carat piece, measuring 63mm by 32mm, was found by Gert Jonker on his father, Johannes’ claim. Johannes, a 62 year old digger who had little luck until then, became wealthy overnight, but eventually died in poverty. The stone was cut into 12 gems, including the Jonker itself with 66 facets and 146 carats, but later re-cut to a 126 carat oblong, said to be the most perfectly worked stone in existence. The Ice Queen appeared on Premier’s grease tables in May 1954, and on examination, turned out to be an internally flawless 426,5 carat, 51mm by 25mm stone which, in Sir Ernest Oppenheimer’s view, possessed the most perfect colour of any diamond he had seen. The Ice Queen produced the famed Niarchos Gem named after the Greek shipping magnate, Stavros Niarchos who bought it from Harry Winston for a reported $2 million. Other notable South African diamonds include the Eureka, the diamond discovered in South Africa which began the great rush leading to the establishment of Kimberley and adjacent mines. The Kimberley Rough, discovered around the turn of the century in somewhat mysterious circumstances. 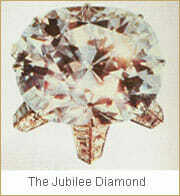 The stone weighed 503 carats and probably came from either the De Beers or Dutoitspan mines. It produced a flawless 70 carat emerald cut in 1921, and was re-cut five years later to increase its brilliancy. 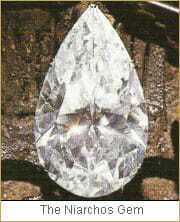 The 469 carat Victoria (also called the Imperial and the Great White was found at either Kimberley or Jagersfontein in 1884. It produced the superb oval shaped brilliant, the ‘Victoria 1884’. The cutting process took a full year, and the stone was bought by the Nizam of Hyderabad. The De Beers, a fine light-yellow octahedron, was found in the mine of that name in 1888. It weighed 440 carats, and was cushion-cut into the fourth largest polished diamond in the world. As time goes on, mines go deeper, technology improves and new diamond bearing earth is discovered. Who knows what next great discovery will tip the scales against the past weights and quality, and who will be the one to find it? Prepare a small bowl of soapy water with a mild liquid detergent. After a few minutes of soaking (or one hour if the stone is dull and dirty), simply brush the ring and stones gently with a soft toothbrush. Rinse it in clear, warm water and pat dry with a soft, lint-free cloth. Soak the ring in half and half solution of cold water and household ammonia for thirty minutes. Lift out and gently tap around the front and back of the mounting with a small, soft toothbrush. Swish the ring in the solution a second time, rinse, and drain on tissue paper. Use any of the brand name liquid jewellery cleaners and follow the instructions given on the label. DO keep diamonds in a fabric-lined jewel case with compartments. If placed in one compartment together, diamonds should be wrapped in tissue paper as one diamond can scratch or damage other diamonds. DO NOT wear your diamond engagement ring while doing extremely rough work. Although a diamond is the hardest substance on earth, it is brittle and can be chipped by a hard blow. DO make sure that your ring never comes in contact with chlorine bleach. It won’t hurt the diamond, but it can pit and discolour the mounting. DO NOT forget to have your ring checked by a jeweller once a year for loose stones and to ensure the mounting is secure. DO remember that you’re wearing the most durable, yet beautiful substance known to man. Enjoy!